She received a Lifetime Achievement award in 2012. 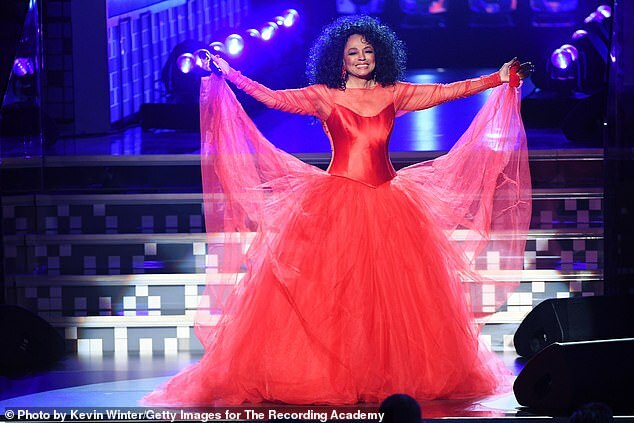 And Diana Ross proved she was the ultimate powerhouse as she took to the stage at Staples Center during the 61st Grammy Awards in Los Angeles on Sunday night. The 75-year-old singer certainly passed on her gift for performing as her adorable nine-year-old grandson Raif-Henok Emmanuel Kendrick stole the show with the sweetest introduction. The matriarch appeared in front of the crowd wearing a magnificent red gown complete with caped sleeves. Sheer material lined her arms leading into a satin bodice and massive tulle skirt for the performance. Her quick show included The Best Years of My Life and Reach Out and Touch, where she walked into the crowd to sing. Diana’s massive family was on-hand in the front row to cheer the legend on, with Tracee Ellis Ross whipping out her phone to record alongside Rhonda Ross Kendrick.